True Fashionista Now > Uncategorized > Beyonce to Wear Givenchy Couture in New Video? Givenchy 2011 Couture – Front. Fashion blogs are abuzz that Beyonce will sport one of the looks from the Givenchy 2011 Couture Collection in her new video “Girl.” Fashionistas put two and two together, after a few low-resolution photos of her video shoot were leaked online. I love how fashionistas take their fashion seriously and can spot couture miles away. The selection is designed by Riccardo Tisco, the one everyone is also abuzz about, to replace John Galliano at Christian Dior. 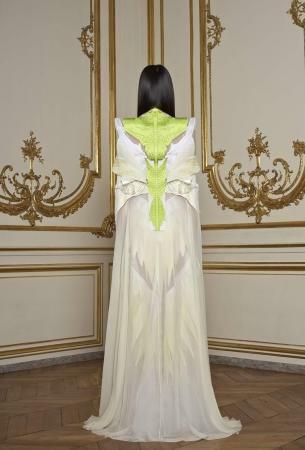 Givenchy 2011 Couture – Back. Beyonce on the set of her new video “Girl”. Chloé comme Parris Collection at Toronto Fashion Week 2011.